This Chickpea and Avocado Mash is a healthy, easy breakfast, lunch or snack option. I added chopped cilantro and spread it on toast. I like to spread it on warm whole grain toast, topped with a sliced tomato and a fried egg. But you can also eat it with crackers or pita crisps, as a vegetable dip, on top of flatbreads, in pitas or wrap, as a sandwich or as a warm crostini appetizer. (See the recipe below). This can also be served as a salad on top of a bed of greens. This base master recipe also allows you to play around with other flavors, add-ins and ways to use as you like. I’ve given you lots of tasty options here. This recipe can be made 2 days ahead of time and stored in a covered glass bowl in the refrigerator. 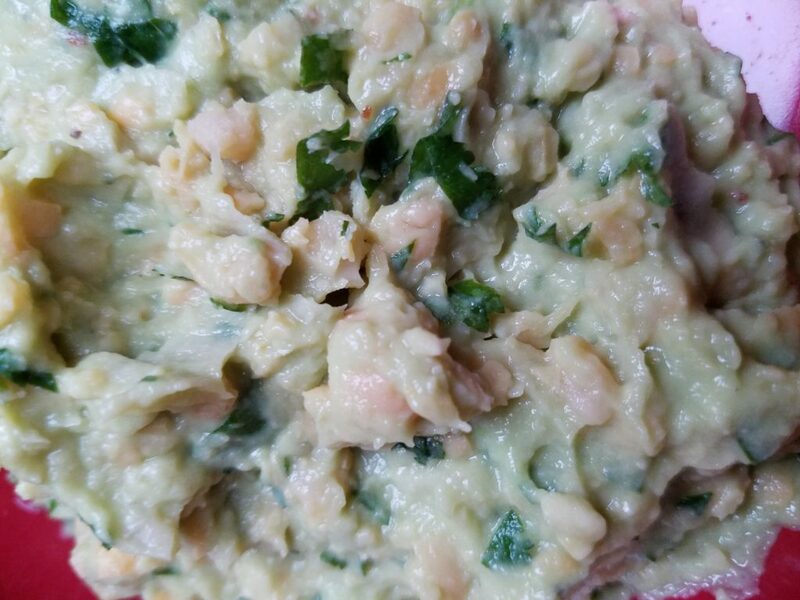 In a medium bowl, use a pastry blender, fork, or potato masher to mash the chickpeas and avocado together. (Mash as little or as much as you prefer. I like mine a bit lumpy). Add in the lime or lemon juice and season with salt and pepper and add in any optional additions and mix again to incorporate. Serve in a wrap, on bread, on toast, or as a dip with vegetables or crackers. Top with optional toppings. Pop 4 slices of crusty artisan bread in the toaster, or on the middle rack of an oven set at 350 degrees F, until crisp and golden brown. 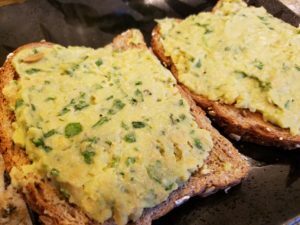 Spread the chickpea avocado mash on the toasted bread and drizzle with extra virgin olive oil. Sprinkle with freshly ground pepper and sea salt.